Bay Harbor Marina’s service department can do it all and do it right. 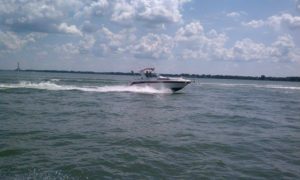 When it comes to boat maintenance, boaters can be very detail oriented. So when our customer satisfaction ratings are consistently among the highest in the industry - we know we’ve earned them. In addition, Bay Harbor is the preferred repair facility for most major insurance companies. Certified by all the major marine engine manufacturers, and using the latest training and diagnostic tools, Bay Harbor can handle all your mechanical, fiberglass, and wood repairs. The award-winning service team at Bay Harbor is led by four Premier Mercruiser mechanics – more than any other mid-Michigan service center. Certified fiberglass and wood craftsmen pride themselves on expert color matching and attention to details. Keeping your boat looking its best is an investment that pays you twice: when trading or selling; and again for personal enjoyment. The experts at Bay Harbor use the most advanced coating technology for hulls, decks, and bright work in a year-round, heated facility for boats up to 70’. Major insurance work and renovating are also performed by skilled, certified technicians.